The FileMaker Cloud is here, and we are excited! 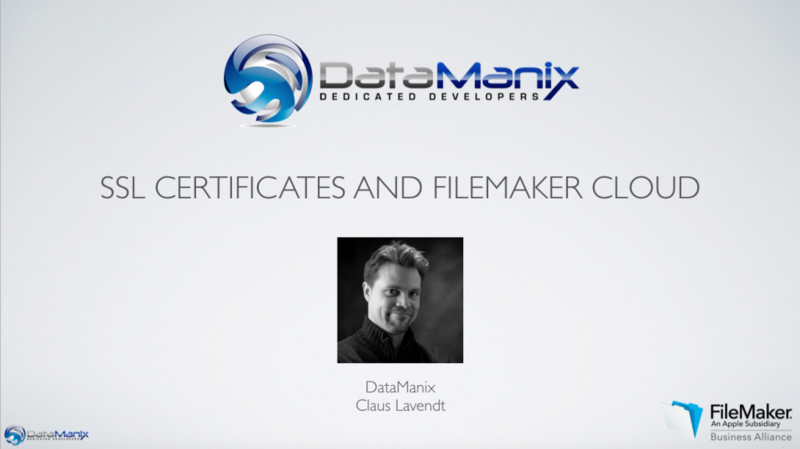 There are many great things to say about the FileMaker Cloud and we think this is a very important and great addition to our platform. Frankly, the process is very complex, even for seasoned developers and server admins and involve several terminal commands. Wouldn’t it be great, if there was an app for that ? That’s what we thought, so we have created a FileMaker Custom App, that helps you with the process of renewing your FileMaker Cloud SSL Certificate. Not only is this app completely free, it is also completely open source. And you can download it below. Now, how do I use this tool ? I’m glad you asked. Richard Carlton and Claus Lavendt did a video on this topic, where we are walking through the tool and explains the process. Beside a walkthrough of the tool, we also discuss the concepts behind and we think this video is worth a watch. PLEASE NOTE: We have found a bug in the tool. 5) Now the tool concatenate the 2 files from Comodo and you can now re-import the certificate file into your FileMaker Cloud instance.